Training your dog can be simple and pain-free with the Vibration & Static dog collar by Puss and Pooch. This wireless collar makes the training process easy for both you and your furbaby, offering a solution for barking, chasing, chewing, licking and other pesky pup behaviors. With four settings—static shock, vibration, beep, and light—it's a safe and humane electronic collar that allows you to decide what works best for your pup. And you can be sure your collar is always ready when you need it, thanks to a rechargeable, long-lasting lithium-ion battery. No matter your dog's size, you can train him safely and easily with Puss and Pooch. Variable training options include static shock, vibration, beep and light, which allows you find the right way to train your pup. Designed to help curb behaviors such as barking, chewing and digging. Waterproof and rechargeable, which means you can train your pal all day, on the go and even on the surf! The collar can be adjusted to fit multiple breeds with an approximate size of 8 to 26 inches long. Tested for safety and quality to ensure no level of shock will hurt your dog. 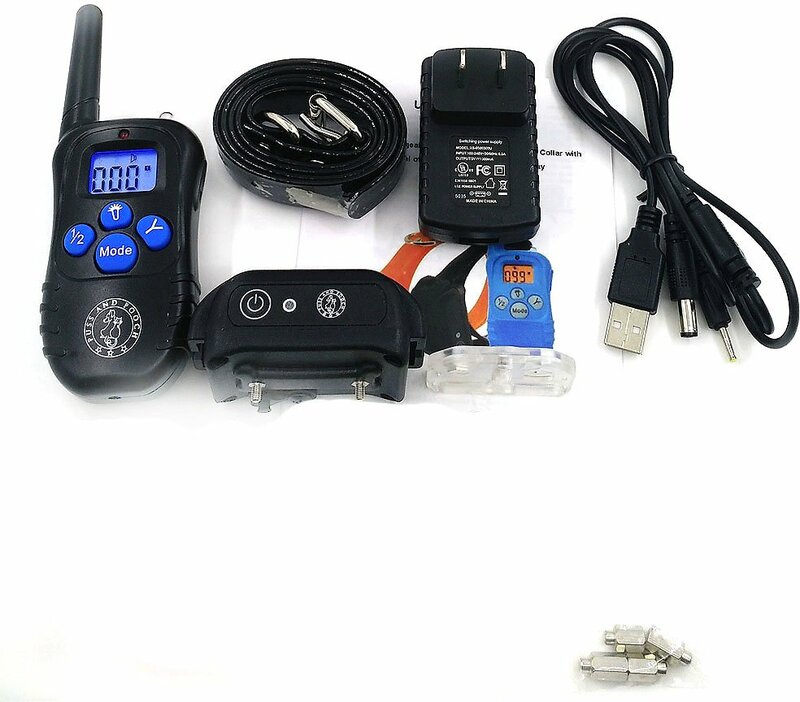 (1) collar receiver, (1) remote transmitter, (4) metal prongs, (1) collar strap, (1) plastic test bulb, (1) rechargeable battery, (1) wall charger, (1) cable charger. Please ensure that you check the fit of your pet's collar frequently. If any skin irritation occurs, discontinue the use of the collar for a few days. If the condition persists beyond 48 hours, see your veterinarian. Do not attach a leash to the collar. We recommend the collar not be worn for more than 12 hours each day. Not for aggressive dogs. Avoid leaving the collar on for more than 12 hours per day. If possible, reposition the collar on your pet's neck every 1-2 hours. Never connect a lead to the electronic collar. Wash the dog's neck area and the contact of the collar weekly with a damp cloth. Examine the contact area daily for sign of a rash or sore. If a rash or sore is found, discontinue use of the collar until the skin has healed. If the condition persists beyond 48 hours, see your veterinarian. Risk of skin damage. For comfort, safety and effectiveness of this product, please ensure you check the fit of your pet's collar frequently. If any skin irritation is observed, discontinue use of the collar for a few days. If the condition persists beyond 48 hours, see your veterinarian. Do not attach a leash to the collar. This can result in pull the contact points too tightly against your pet's neck. You may put a separate nonmetallic collar on your dog's neck and attach a leash. Do use a harness for attaching a leash and/or tags while using the collar. The collar is not designed to be worn constantly. We recommend the collar not be worn for more than 12 hours out of every 24 hour period. Most pets feel uncomfortable at first wearing the collar. Don't use any functions before your pet has gotten used to the collar. We suggest you give the dog Vibration before starting the Static Shock. After a time of training, the dog will learn that Stimulation will come after Vibration. In this way, the vibration alone can effectively curb the improper deeds of the pet. The Stimulation only acts as a menace that might be unnecessary for most of the time. Check contact points for tightness weekly. Clean contact points with alcohol weekly. Check your dog's neck for irritation frequently, and wash neck weekly. 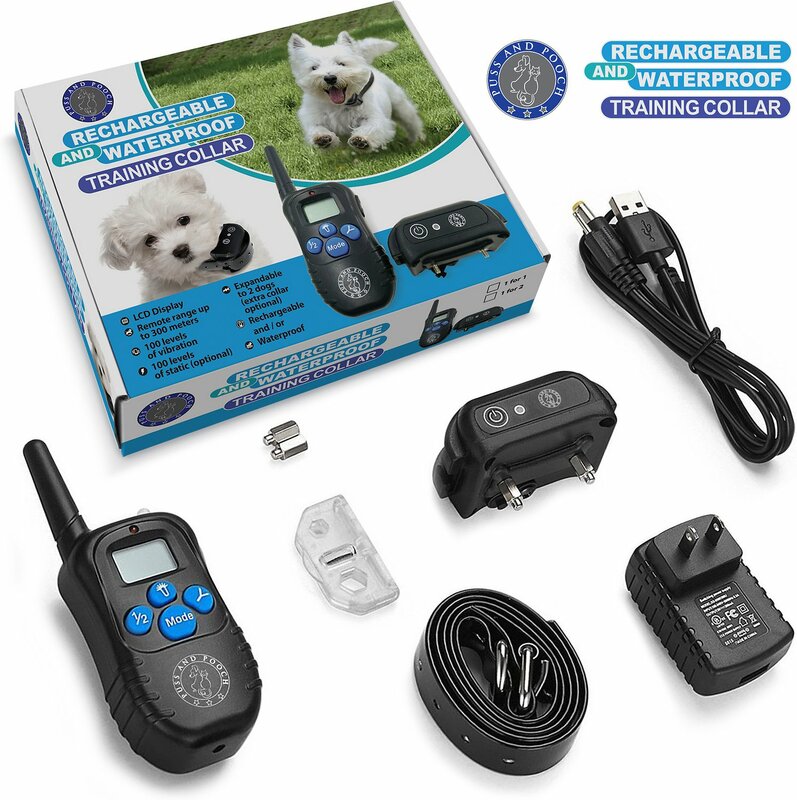 My pet does not respond after correct installation and waterproof training collar, or it does not work? You need to charge the remote transmitter and receiver collar for 6 hours individually first. Turn on the remote transmitter by holding the Mode button for 5 seconds. Check the levels of vibration or static shock. Make sure the receiver collar has enough power to operate. Restart the receiver collar by pressing the on/off button. Test 4 functions (beep, light, vibration and shock) first before using. See "Test" portion of Operation Guide. Intensity level has to be more and "0" when encode, test to launch for vibration and static shock function. The receiver collar will go into deep sleep if no operation for 5 minutes. Any movement will activate it. Make sure the contact points are placed snugly against your pet's skin. Trim your pet's fur where the contact points touch the neck and/or switch to the longer contact points. If all of above do not work, try to re-encode between remote transmitter and receiver collar. Remote Transmitter does not work. Charge the remote transmitter for 6 hours when you first receive the product. Check if the remote transmitter is on low battery status. You need to hold the remote transmitter for 5 seconds to turn it on. Remote transmitter will automatically go into standby mode if no action is detected within 2 minutes, at this time there will be no LCD display. Press any button except LED light to re-activate the remote transmitter. Remote transmitter will automatically go into deep sleep status is no action is detected within 5 minutes, at this time there will be no NCD display. You have to press "Mode" for 5 seconds until LCD display. My receiver collar works great for some time, but it does not work anymore after I charged it. Check if the charging is successful. When it is charging, a red LED light will appear. After fully charged, the light will be green. You must turn on the received collar again after charging. We turned on the receiver collar and it starts to beep for 20 seconds. The receiver collar will beep for 20 seconds in low battery status unless it gets charge for 6 hours and the other functions will work after charging is finished. I want to test the receiver collar myself, but it does not work. If you test the receiver collar on your hand or leg, please touch the 2 electrodes at the same time, only touching one electrode will not work. The receiver collar is in bad shape, it didn't work after being knocked down. Please avoid dropping the receiver collar to avoid breaking the structure and circuit. How old does my pet need to be before using this product? Your pet should be able to recognize basic obedience commands such as Sit or Stay. This collar may be too large for pets under 8 pounds. Once my pet is trained and has been obeying my command, will he have to continue wearing the collar? You may need to reinforce training with the collar from time to time. Can I use the collar with more than one pet? Yes - you can simply add one more receiver collar to the system. Will I get exactly 300 yards of range with the remote trainer? 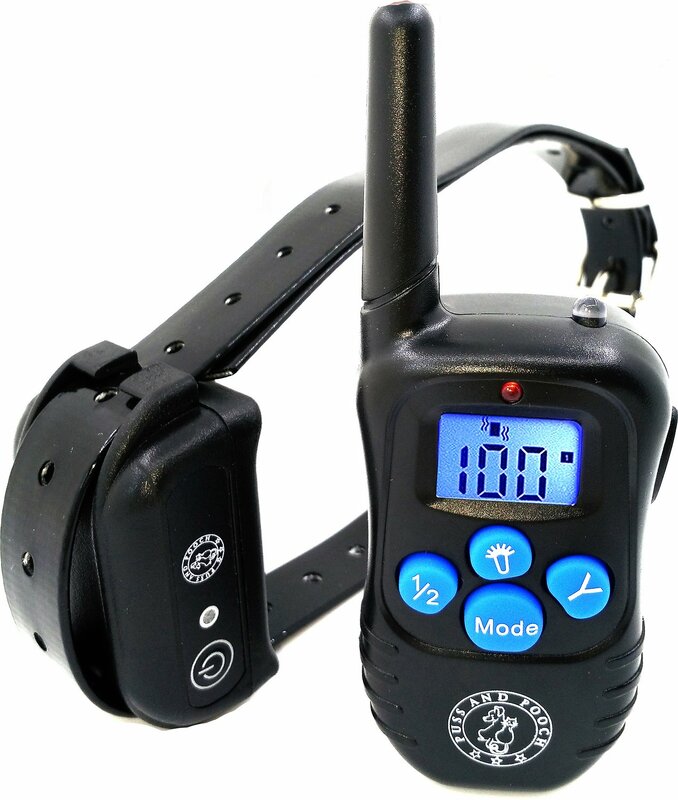 The effective range of the remote trainer mean the straight line distance between the remote transmitter and the receiver collar without obstacles. Range may vary according to terrain, weather, vegetation, battery capability and trasmission from other radio devices. How long can I continuously deliver vibration or static shock to my pet? The maximum amount of time you can press the vibration or static shock to your pet continuously is 10 seconds. After this, the remote trainer will time-out, and the vibration and static shock must be released and pressed again. Yes, your pet can swim in the water. Can I place the receiver collar on another collar? No. The collar used for this unit has a sleeve to hold the antenna. Can I attach a leash to the receiver collar? How long should training sessions be? Training sessions should be kept positive and short, about 10-15 minutes each time. I'm more than satisfied - I'm thrilled!!! Our Teddy-bear Cookie is a sweet girl but she has a couple of habits that are driving me crazy! Even thought about given her away, but she is getting to be an old girl so that would not be good for her or I, being part Bichon she barks constantly and rolls in something stinky, then she wants to sleep with me, yuck! So I have been buzzing her when she does that and it has cut that down tremendously, as far as the barking goes she does not bark when she has the collar on, yippee, there is peace for at least a while, having three yappers is A LOT. I have not had to use the static setting. It did not stop the bad behavior of my dog. At first she heard the sound of the beep and turned her head around trying to see where it came from, then I used the vibrate which she did feel cause she would shake her head, but she never stopped doing her bad behavior, just shook her head and kept on doing it lol Perhaps it would work on other dogs? But not on mine! Ive used this on both dogs for various behavior modifications. One is a golden, the other a sheltie. It has worked right away. They know when the collar is on without even a correction for 99% of the time - don't be begging for food, eating poop, scratching at the bed, etc. This unit is easy to use. I have a lab who is 10 months with a ton of energy. I need to correct her from on furniture and jumping at us. I bought it for the vibration feature as opposed to the shock feature. With so many digital levels, I have it very low and she does obey the message. Having rechargeable batteries is also a big help, not that you have to charge them that often. I have had this collar for less then 5 months. Some of the display numbers no longer work, so sometimes it is a guesstimate as to what numbers are displayed. I got this for my 8lbs Yorkie so that I could beep or vibrate the collar when he barks way too much and he immediately picked up on beep=bad boy. Only used the vibrate one time when he was trying to run after a squirrel in the yard and it was painless but got him to stop. Great for training without hurting!